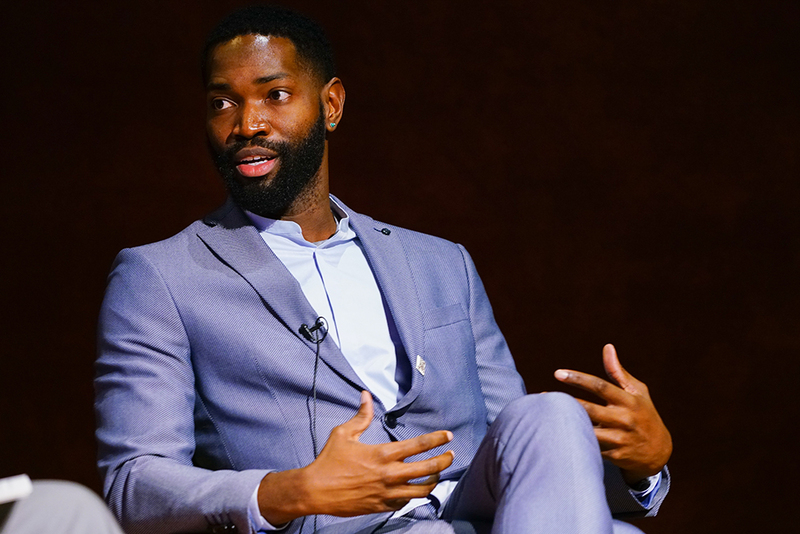 Tarell McCraney, the playwright whose work inspired the Golden Globe-winning and Oscar-nominated film “Moonlight,” sat down with The Miami Hurricane last Wednesday, Feb. 8, to discuss the film, the importance of intersectionality and the general importance of film and art to its audience. The Miami Hurricane: Over the past years, there has been more acceptance and respect for LGBTQ. “Moonlight” was not categorized as a gay or black movie but rather recognized as a great movie with no need for any distinction. Does this mark progress? How have things changed since your childhood in Liberty City? Tarell McCraney: We are really excited about people going to see “Moonlight.” It’s not the type of film that normally gets this kind of acclaim. And if that helps people, helps more people get films like it made or films dealing with complicated issues, then that’s great. I would love to know that other young filmmakers can tell stories that are intimate to them, get them made and get them to a platform where lots of people are seeing them. TMH: Intersectionality recognizes that different identities play a role in describing ourselves. How do you see these identities playing their roles? Are there some identities that are more defining? TM: Those are fundamental questions that I have no answers to. The job of art, really in a weird and strange way, is to draw our eyes to these fundamental questions. We hope science will find ways to make it easier to answer those questions. In the event that they don’t and we are wrestling with the unknown, it’s art’s job to make a frame around it, so everybody knows we’re all asking the same fundamental questions. Yes, we all want to be a part of a community, but we want individual characteristics to help enhance that community. I think intersectionality is the only way to do that. How? I don’t know – I know being aware of it helps. TMH: What do you think is the most important aspect of a film that really captures and keeps the audience’s attention? Do you think it’s the plot, the character development, language, body language or something else? TM: Barry Jenkins, who is the director and screenwriter for “Moonlight,” talks about film as being sound and picture. I work mostly in the theater. Although there’s visual aspects, the theater is a much more oral place. I have to do something with the language of the theater to get you to imagine it. In film, they show you exactly what something looks like. In “Moonlight” specifically, we were showing a part of Miami that people didn’t really know about. In a play, I could tell you what that place looks like, but until Barry actually took a camera to Liberty City, you couldn’t see it. That’s important about film – it can take you to a place that you didn’t know existed. TMH: In one of the most poignant scenes, Juan teaches Chiron how to swim. This scene is strong because so many people can resonate with it. Did you have a mentor or a person like Juan in your life? TM: I’ve had mentors my whole life, but that character was based on a real person. The entire first two-thirds of the movie are based on actual events that happened in my life. In the original script “In Moonlight Black Boys Look Blue,” that character was named Blue because that’s what the person’s name was in real life. He taught me how to swim and ride a bike. He also was a drug dealer and all that stuff. TM: I’m definitely surprised with its reception. It’s been a surprising and mostly wonderful ride. I had a clue it would turn out pretty good, and Barry is a genius, but I didn’t know it would reach this level. It’s humbling for sure. TMH: If you could tell the audience one thing about the movie, what would it be? TM: I would tell them that it’s a story of a lifetime. Not every life, not all lives, but a specific life. It zeroes in on a specific life in a way that is very enjoyable. It’s really exciting to chart someone’s life in a way.